PDFCreator 2.0.2 Free Download. Word Processing PDFCreator is a program that lets you create PDF documents from other applications, mainly from word processors and other programs that allow printing documents. It is compatible with Microsoft Word, OpenOffice, Worpad, Notepad and Excel, among other applications; so that when you edit or create a document, you will be able to export to PDF Print option from the document. A program to create PDF. 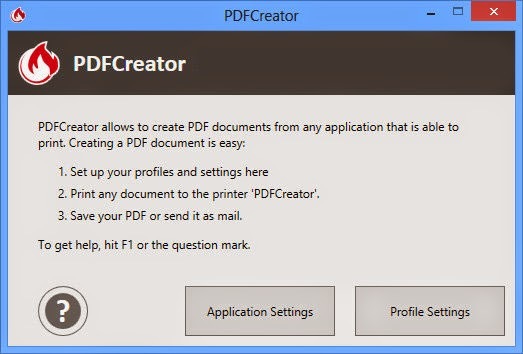 PDFCreator works as a virtual printer, so when you want to save a document in PDF must be selected in the list of available printers, which bears the name of this application. Instead of printing (what would happen if you select a physical printer), what it does is give the possibility to save a PDF file. In addition to saving as PDF, you may do to other formats such as: PNG, JPG, BMP, TIFF, PS, EPS and PCX. This version adds a tool called Images2PDF used to convert images. The conversion of documents is managed by the Ghostscript interpreter, which is updated with each new version of PDF Creator. This application allows you to create a single file from multiple sources, and also encrypt documents to protect them and are not editable. From this version also allows signing documents. Download PDFCreator 2.0.2 Free. PDFCreator 2.0.2 is the latest version, updated in January 2015. It is easy to install and use, and most importantly it is free. Works on Windows 8, 7, Vista and XP. It is available in many langs.